This morning our pilgrims walked to the Basilica for Mass at the Tomb of St. Francis, in the Lower Basilica. 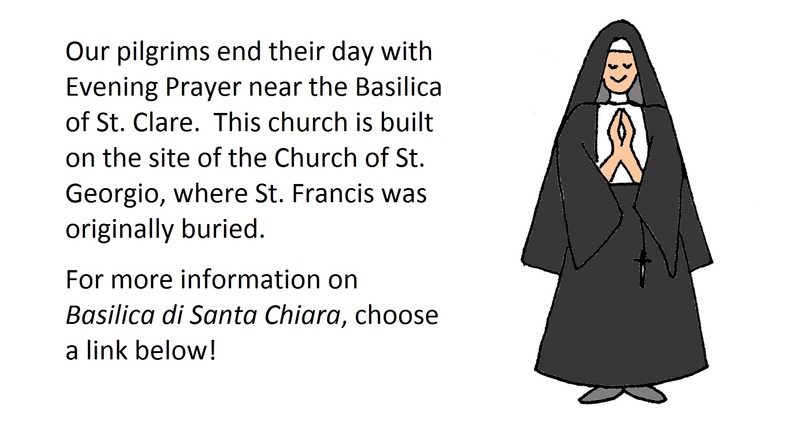 To learn about the history of St. Francis’ tomb click here. After exploring the holy town of Assisi for the remainder of the morning, this afternoon we travel to the Hermitage of Carceri on the top of the mountain, where St Francis spent much time in prayer and contemplation. Lord Jesus, the town of Assisi proclaims that your Creation is sacred; that all around us is Holy Ground. For wherever we gather in your name, there you are in our midst. Grant that today we feel your presence in our lives. Amen.